The Bonefish Flat: Friday's Flat Rant: What up With Fly Fishing and Golf? Friday's Flat Rant: What up With Fly Fishing and Golf? It's 8:30 p.m. and I finally sat down from work, kids, a little picking up the house and I just want to relax so I've turned on the U.S. Open which for people who don't care is being played this week at Pebble Beach. This has me thinking, why do you read of so many comparison's between golf and fly fishing? Full disclosure here, I used to play a lot of golf and could hold my own on the links. Because of time, work, life I really don't get to play much anymore and since I can't play competitively, I've sort of lost interest. I love fly fishing because it gets me outdoors and you can really clear your head and focus on you vs. fish. Man, I'm really starting to want to go fishing right now. 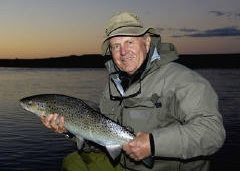 Jack Nicklaus, the greatest golfer of all time, loves to fly fish. In fact, he was an honorary chairman of the Federation of Fly Fishers. I've also read that Tiger Woods likes to fly fish too (I was going to make a joke here, but really, why bother). I don't picture the Angling Exploration Group playing golf...at least not seriously. If you read a lot about fly fishing, you'll see a lot of comparisons to golf. For starters, you can do both in some pretty average places and some really beautiful places. For us saltwater fly fisherman, fishing the Seychelles would be the equivalent to playing Pebble Beach. Fishing the old pond behind the barn? You're playing the public course in the city (think Hain's Point if you've ever been to DC). I think too that these two sports are similar because they are both highly individual. In the end, its you and the golf ball or you and the fish. What about a guide, you might say? Ever heard of a caddy? Same difference, you see. Both sports are also really gear-centric. You really don't need that new driver to shave a few strokes off your game. And you really don't need another 8 wt to replace the other fast action stick you bought 2 years ago. But both groups want them, and in fact may "have" to have them. I really have to have a new S4S 8 wt, but my old T3 will really do just fine. New fly line, what about new golf balls or a new bag? Probably the best comparison is both sports take practice. You wouldn't play Pebble Beach without bringing your "A" game. I wouldn't go to the Seychelles, Florida Keys, or Belize unless you been practicing, too. So there you go, fly fishing and golf have a lot in common. Happy fathers day to all the dads out there. And dad, since you're one of the millions of bonefish flat fanatics, happy fathers day. Mothers and kids, your father probably wants a new S4S 8 wt for all he does for you every day. But what he really needs is just for you to take him fishing.